Everyone knows that mountain biking is a dirty sport. At no time is it dirtier than right now, early season in the mountains. Rain, melting snow and wet trails combined with an unstoppable desire to ride make for dirty, muddy bikes. The problem with a muddy bike is dirt gets everywhere; on you, in the car, in the garage. It doesn't have to be that way. 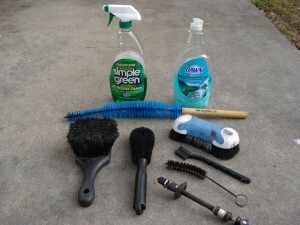 All it takes to have a clean bike is some dish soap, degreaser and a good set of brushes. 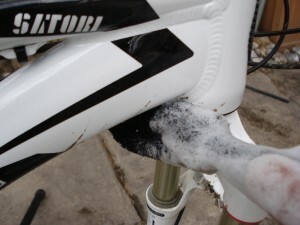 Just follow these steps to get your bike ready to be dirty again. 1. Using a high pressure jet, spray off the majority of the mud from the frame and rims. Avoid directly spraying the hubs, bottom bracket, headset and suspension to reduce water contamination. 2. 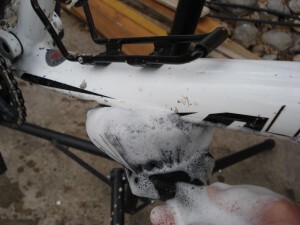 Spray the derailleurs, chain, cassette and chainrings with degreaser and allow it to soak in. 3. Fill a bucket with dish soapy water (warm if possible and lots of suds). 4. Using a large square brush, wash the rims, tires and spokes. Use a skinny brush to clean the hubs. 5. Wash the frame and fork with the large brush. Use a skinny brush to get into tight areas. Do not scratch the upper fork or rear shock tubes. 6. Remove the rear wheel and scrub the cassette with a dedicated greasy brush. Re-install the wheel. 7. 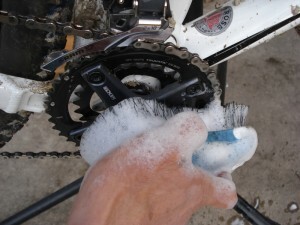 With the same dirty brush, clean the side of the chain by brushing it against the outer chainring. If done properly, it should come out looking like new. 8. Clean the chain rollers by wetting the greasy brush and scrubbing the chain while rotating the pedals backwards. Wet the brush often and continue until the water dripping off comes out fairly clean. 9. Rinse. Using a high pressure spray, rinse out the derailleurs, chain and cassette while rotating the pedals backwards. Use a low pressure for the rest of the bike. 10. Lift the bike up and give it a couple bounces to get the loose water off. Wipe or air dry. Lubricate the chain before riding. 11. Wash the frame and fork with the large brush. Use a skinny brush to get into tight areas. Do not scratch the upper fork or rear shock tubes. 12. Remove the rear and scrub the cassette with a dedicated greasy brush. 13. 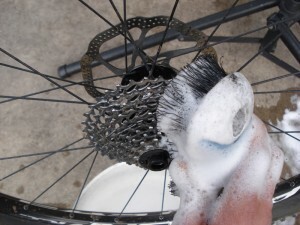 With the same dirty brush, clean the side of the chain by brushing against the outer chainring. If done properly, it should come out looking like new. 14. Rinse. Using a high pressure spray, rinse out the derailleurs, chain and cassette while rotating the pedals backwards. Use a low pressure for the rest of the bike. 15. Lift the bike up and give it a couple bounces to get the loose water off. Wipe or air dry. Lubricate the chain before riding.